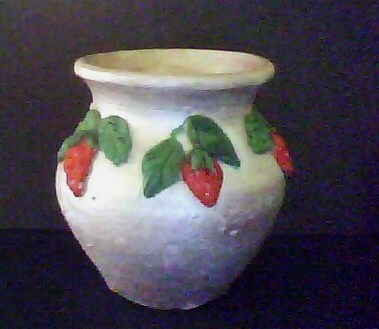 This is a simple pattern of strawberries encircling an earthen pot. I agree with most people that working with ceramic powder is easy as there is no cooking involved like Air Dry Clays.Its also easily available off the shelf in craft shops. One needs to know the recipe to make the paste(which I have given in my blog) , acrylic colors, varnish and paint brushes and a design. Its best to keep yourself free for a few hours , depending on the design while you work. Its better to finish off the ceramic paste in one go to avoid any disappointment as it may dry later unless stored properly!